There are two things toward the top of my “What I love most about listening to music” list: 1) hearing a unique, mesmerizing vocal and, 2) listening to full-length albums of classic bands where I only know the hits. Today’s CTT entry checks both of those boxes for me and I’m excited to dig into some good tunes. In 1962 Marty Balin recorded a couple singles for Challenge Records, but neither were successful. After being inspired by merged folk and rock acts like The Byrds and Simon and Garfunkel, in 1965 he decided to form a band following that lead. With a group of investors, he bought an old pizza parlor on Fillmore Street in San Francisco, Calif. He turned it into a music club called The Matrix and used it to attract musicians to find his new band mates. After a few weeks, the plan worked and the band was formed. Needing a name, guitarist Jorma Kaukonen explained he had a friend that would come up with funny names for people—he blurted, “You want a silly band name? His name for me was Blind Thomas Jefferson Airplane!” Dropping Blind Thomas, Jefferson Airplane made their first public appearance at The Matrix on August 13th of 1965. After a few shows, the band was improving and getting notice from local media. RCA signed them to a recording contract and gave them an unheard-of advance of $25,000. The group’s debut album came out in September of 1966 to limited release. RCA only pressed 15,000 copies, but 10,000 were sold in San Francisco alone, prompting a re-print. With co-lead singer Signe Anderson having a baby in ’66, she announced her departure from the band. Cue Grace Slick, a friend of the band since their very first show at The Matrix. Slick’s powerful and supple contralto voice complimented Balin’s vocals and the overall psychedelic vibe. 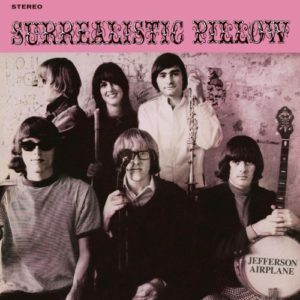 Realizing album number two needed to capitalize on this, Surrealistic Pillow was released in February of 1967. Slick came prepared with two singles from her prior band, which highlighted her unique singing abilities. Both would go on to become mega-singles and the breakout hits for the band. The album would peak at #3 on the Billboard charts and has been certified platinum in the U.S. Most of us have probably heard the two singles mentioned above, but Jefferson Airplane’s legacy is so much more than that. 1960’s counterculture truly started in San Francisco and bands like Jefferson contributed to that movement. The psychedelic rock sound of the era could almost be re-labeled as San Francisco Rock and no one would bat an eye at the reclassification. Thinking about the impact of the music, it’s amazing the album only took 13 days to record on a budget of $8,000. In the era of experimental drug use, the band was heavily under the influence and considered making the album a “spiritual experience.” They became the face of the movement by being featured on The Tonight Show and The Ed Sullivan Show—with a historic performance on The Smother Brothers Comedy Hour, one of the first to be videotaped in color and augmented with video techniques to simulate their signature psychedelic light show. While they never quite found the success of this album in later efforts, the band would turn into Jefferson Starship in the ‘70s and reunite as Airplane in the late ‘80s and mid ‘90s. They were inducted into the Rock and Roll Hall of Fame in ‘96 and presented with a Grammy Lifetime Achievement Award in 2016. You can go ask Alice, I think she’ll know picking Surrealistic Pillow up for $5 bucks is a steal.